Tokyo, Japan - Panasonic conducted a demonstration experiment of its: (1) "sports spectator solutions" that enriches spectator experience with multiple viewing angles and (2) information distribution service using above ground power distribution equipment[*1] at the "IBSA[*2] Blind Football World Grand Prix 2018" organized in the Tennozu Park, Shinagawa, Tokyo from March 21 to 25, 2018. *1: Electrical facilities above ground that house transformers and switches, which were placed on utility poles before powerlines began to be buried underground. *2: International Blind Sports Federation. 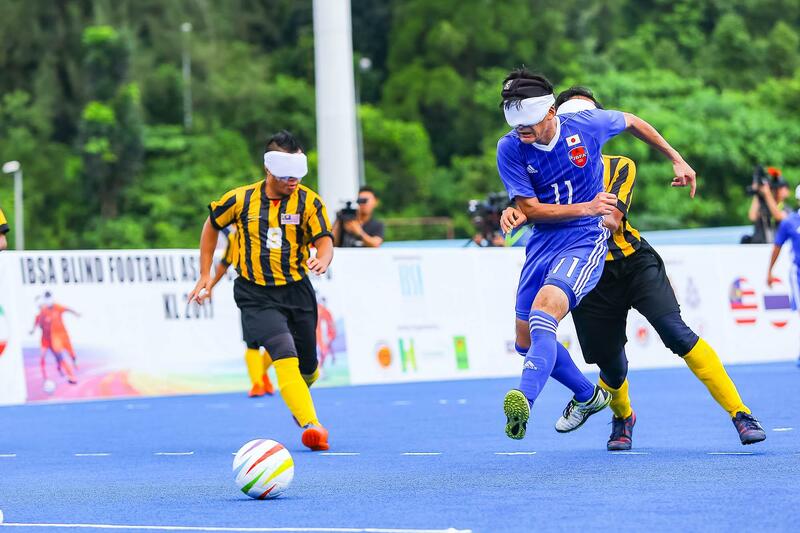 The IBSA Blind Football World Grand Prix is an official competition of the IBSA, which was held for the very first time this year. At the venue, Panasonic provided services that amplified the excitement of watching Para sports to evaluate and verify the usability and performance of its information distribution service onsite. Panasonic implemented the "multi-video distribution system" (VOGO Sport), which delivers videos shot from multiple camera angles together with audio to smartphones and tablets. Not only could spectators enjoy the game from the angle of their choice, the wide distribution area allowed competition staff and volunteers to keep apace with what was going on inside the venue. Its effectiveness as an advertising media was also examined by displaying sponsor logos on top of the screen. Panasonic also installed a 200-inch LED screen on the side of the pitch, which magnified the excitement of the game. In cooperation with Incorporated NPO, Japan Blind Football Association, TEPCO Power Grid, Inc. , TEPCO Town Planning Co., Ltd. , and the Shinagawa Ward, Panasonic offered its information distribution service utilizing above ground power distribution equipment (8 units) in the Tennozu area, nearby the venue. 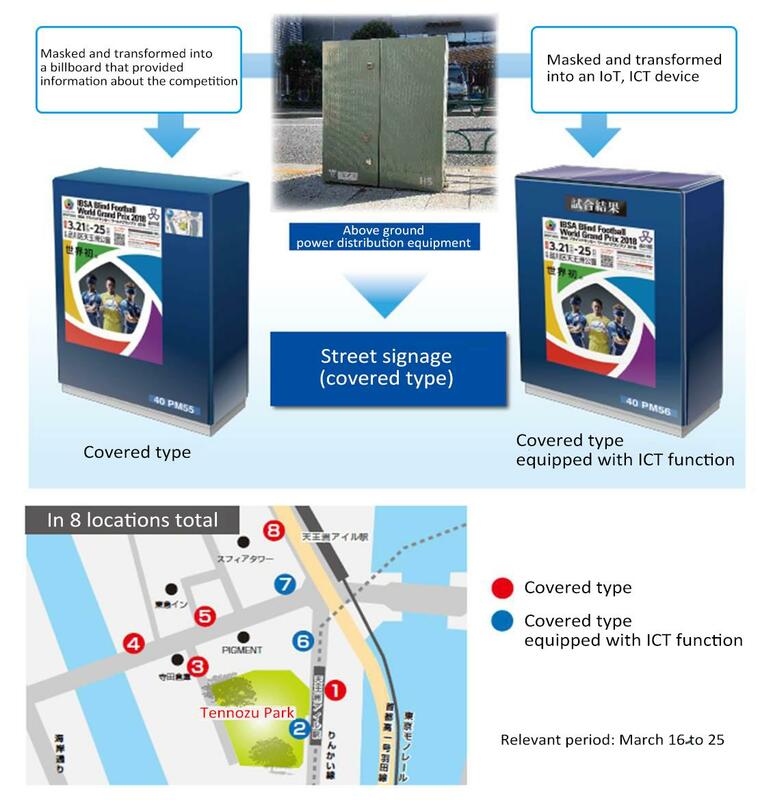 "IBSA Blind Football World Grand Prix 2018" posters were placed on the above ground power distribution equipment, and on those equipped with LED display devices, Panasonic used Low Power Wide Area, "LPWA,"[*3] wireless communication technology to display what was happening during the competition and various other information in real time. The power necessary for the LED display was created using solar sheets placed on top of the distribution equipment and stored in storage batteries. *3: Low Power Wide Area is a type of low power, long range communication network. Panasonic will continue to propose and provide solutions for venues and peripheral areas such as audiovisual equipment and spectator solutions and also contribute to raising awareness for and interest in Para sports. Blind football - image (photograph provided by: Japan Blind Football Association). 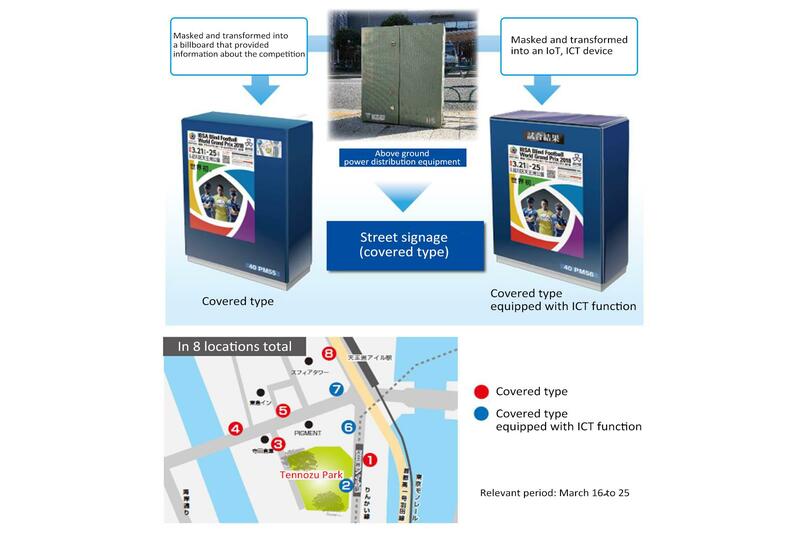 Information distribution service using above ground power distribution equipment.